Our Quirky, 1 Bedroom, Luxury Cottage. 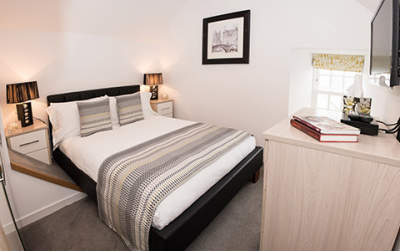 At the heart of Lerwick's town centre, 4 Law Lane is a traditional yet contemporary one bedroom luxury hideaway, providing a delightful central stay. The cottage is just round the corner from all Lerwick's amenities, including the Shetland Museum and Archives, Mareel cinema & music venue, many restaurants, bars and cafe's. It's also based just a stones throw away from the small boat harbour, tourist office and 'Da Street' Lerwick's main shopping area. Please click on availability to find out more about this quirky cottage in the heart of Lerwicks old town. The properties featured are offered as self-catering accommodation on a nightly basis minimum 3 night stay. Entry at 2pm on date of arrival and vacation is 10am on date of departure unless otherwise stated, subject to the hiring Terms and conditions. 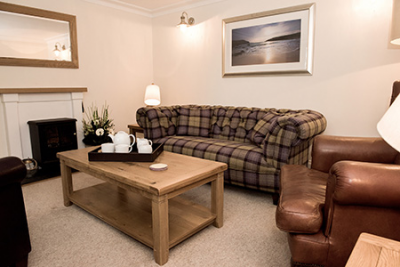 All reservations are subject to confirmation by Luxury Apartments Shetland. In the event that a property is not deemed suitable by Luxury Apartments Shetland for the party or due to circumstances beyond our control, a property becomes unavailable, Luxury Apartments Shetland will refund any credit card or other payment (including handling charges). We strongly recommend that you use travel cancellation insurance to cover the cost of your property. This will provide you with a piece of mind if an unforeseen event forces you to cancel your let. We have tried to make paying for your let as simple as possible. The initial payment is a 20% non-refundable deposit and may be paid by cheque or credit card (MasterCard or Visa) or debit card (Delta) or bank transfer. The balance is payable no later than six weeks prior to the commencement of your let. If you are booking within six weeks of the start of your let, payment in full is required. Overseas visitors are most welcome and because of the difficulties distance can impose we allow up to ten days for bookings to be confirmed from the date a reservation is made. The balance of charges is due six weeks prior to the commencement of the holidays. Payment from overseas should be made by credit card. (MasterCard and Visa) or bank transfer. Any bank charges incurred will be payable by the hirer. Please note that, once a booking has been confirmed, you are liable for the whole cost of the let. However, we will, in any event, endeavour to re-let the property and if successful, we will make a refund to the value of the re-let period, less a 10% admin charge. Accordingly, it is important that cancellations are intimated to us by telephone followed by immediate written confirmation. For this reason, we highly recommend that you take out travel insurance to cover every eventuality. Each property is furnished and equipped to cater for the stated permitted occupancy and includes pot and pans, crockery, cutlery, iron and ironing board etc. Major items of domestic equipment are listed in individual details. We only allow pets in The Captains property. Please call us to inform us about your pet requirements. Pets are not allowed at any of our other properties, for logistical reasons..
All properties are supplies with pillows (two per person) duvets and bed linen. Two bath towels, hand towel per person. Dish towels and kitchen hand towels are also provided and are included in the price. Our properties are cleaned thoroughly between each let. However, as only a limited time is available to clean properties it is a condition of your let that you leave the property and its contents as you find it. The Hirer may opt for Luxury Apartments Shetland to clean the property during the hirers stay. This requires a minimum of 24 hours notice and is charged at £15 per hour. 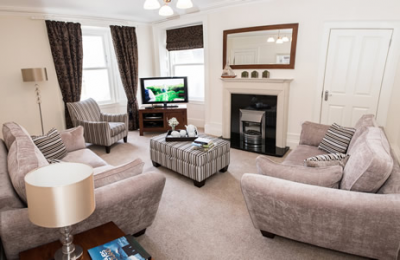 It is important to Leslie and Raewyn Irvine, T/A Luxury Apartment Shetland that you enjoy your stay and every effort has been made to ensure this. However, in the unlikely event of dissatisfaction with the property or any subsequent problem, you should immediately contact us, or the caretaker so that the opportunity to rectify the problem is given. The Hirer shall not sublet the premises or any part thereof. The Hirer binds and obliges himself to vacate the hired premises without demand at the end of the termination of the period of hire. Your initial payment comprises a non-refundable deposit. The balance of the hire must be paid at least 6 weeks prior to the commencement of the holiday. The lesser may treat the booking as cancelled if the balance of the hire is not sent by this date. If the booking is made within 6 weeks of the start of the holiday, payment in full is required. The Hirer agrees that, in the event of cancellation, while all reasonable efforts will be made by the lesser to re-let, the Hirer will be responsible for paying for the period of tenancy booked if a substitute cannot be found. The Hirer shall undertake to prevent any member of his party from causing a nuisance or disturbance to the neighbouring residents or occupiers. The Hirer undertakes to relieve the Lessor from any liability for damage or injury by a member of his party, however caused. The Hirer warrants that the subjects let are to be used for the purpose of a Holiday. Accordingly, Section 12 (2) and paragraphs of Schedule 4 of the Housing (Scotland) Act 1988 applies to the letting to the hirer. Please note that, once a booking has been confirmed, you are liable for the whole cost of the let. However, we will in any event, endeavour to re-let the property and if successful, we will make a refund to the value of the re let period, less a 10% admin charge. Accordingly, it is important that cancellations are intimated to us by telephone followed by immediate written confirmation. For this reason we highly recommend that you take out travel insurance to cover every eventuality. A Beautiful, 4 Bedroom, Historic Apartment. If you're looking for something stunning, 'The Bakers' is just that. This elegant 4 bedroom character property comprising of 3 double rooms and 1 king/twin all with en-suite bathrooms is nestled in Lerwick's historic lanes area. The apartment is within strolling distance to all amenities, including the Shetland Museum and Archives, Mareel cinema & music venue, many restaurants, bars and cafe's. Also just a stone's throw from the small boat harbour, tourist office and 'da street' Lerwick's main shopping area. Please click on availability to find out more about this four bedroomed property in the heart of Lerwick's historic lanes. A delightful 2 bedroom maritime property comprising of 1 double and 1 king/twin rooms nestled in Lerwick's historic lanes area. The cottage is a short walk away from many amenities, including the Shetland Museum and Archives, Mareel cinema & music venue, many restaurants, bars and cafe's. Also just moments from the small boat harbour, tourist office and 'da street' Lerwick's main shopping area. Please click on availability to find out more about this two bedroomed property in the heart of Lerwick.